Pyrazinamide (PZA) is among the first-line drugs for the treatment of tuberculosis. In vitro, it kills semidormant mycobacteria only at low pH. The purpose of this study was to compare PZA resistance with pyrazinamidase (PZase) activity and the genotype to better understand the molecular basis of PZA resistance and to expand the profile of pncA mutations worldwide. Of the 28 tested strains of Mycobacterium tuberculosis, 6 were susceptible to PZA and positive for PZase activity and had no pncA mutations. Twenty-one strains were resistant to PZA and negative for PZase activity and had mutations in the pncA gene, including 15 point mutations, 5 insertions, and 2 deletions. One strain had no mutation in the pncA gene, even though it was resistant to PZA and negative for PZase activity. Three isolates had adenine to guanine point mutations in the -11 upstream region, making this the most common type of pncA mutations in this study, with at least two different RFLP patterns. These data help in the understanding of the molecular basis of PZA resistance. An adenine to guanine point mutation in the -11 upstream region was the most common type of pncA mutation in our isolates. The results of pncA mutation analyses should be carefully interpreted for epidemiologic purposes. Pyrazinamide (PZA) is among the first-line drugs used to treat tuberculosis. In vitro, it kills semidormant mycobacteria only at low pH . In vitro susceptibility testing sometimes fails because of the poor growth of mycobacteria at low pH. Therefore, the pyrazinamidase (PZase) test, which was originally used for the differentiation of Mycobacterium tuberculosis from weakly niacin-positive strains of M. bovis, has been used to identify susceptible strains of M. tuberculosis, because PZase converts the prodrug PZA to pyrazinoic acid, the active form of the drug . The pncA gene encodes PZase, and mutations in pncA are associated with resistance to PZA or loss of PZase activity . The purpose of this study was to compare PZase activity with the genotype to better understand the molecular basis of PZA resistance and to expand the profile of pncA mutations worldwide. Twenty-eight clinical isolates of M. tuberculosis were included. Twenty-three PZase-negative clinical isolates were provided from Korean Institute of Tuberculosis, and these strains had originally been collected from various sites in this country for the purpose of susceptibility testing. Five PZase-positive isolates were collected randomly among the clinical isolates grown at Pusan National University Hospital (PNUH). The type strain M. tuberculosis H37Rv was included as a PZA-susceptible, and thus PZase-positive, control. All isolates were grown in Löwenstein-Jensen medium at 37°C for 3 to 4 weeks. The PZA susceptibility was tested by using Löwenstein-Jensen medium at pH 5.6 with 100 and 500 μg of PZA per mL . The PZase assay was performed by the method described in the Clinical Microbiology Procedure Handbook . Briefly, 6.5 g of Dubos broth base, 0.1 g of PZA, 2.0 g of sodium pyruvate and 15.0 g of agar were dissolved in 1 L of distilled water and heated to dissolve the components. The solution was dispensed in 5-mL amounts into screw-cap tubes and stored at 2 to 8°C until use after solidification of the agar with the tubes in an upright position. A heavy loopful of growth from an actively growing subculture was inoculated. After incubation at 37°C for 4 or 7 days, 1 mL of freshly prepared 1% ferrous ammonium sulfate was added to each tube. A pink band in the agar indicated a positive test. DNA was extracted using an InstaGene matrix kit (Bio-Rad Laboratories Inc., Hercules, CA). A 720-bp segment, including the entire open reading frame, of the pncA gene was amplified by using the conditions and the set of primers P1 and P6 . The PCR products were cut from the gel and purified with the QiaAmp PCR purification kit (QIAGEN GmbH, Germany), according to the manufacturer's instructions. The gel-purified PCR products were quantitated, adjusted to a 200-μmol concentration, and used for direct sequencing by the ABI 377 automatic DNA sequencer (Applied Biosystems Inc., Foster, CA) with 4 pM of each of the above-mentioned primers. The RFLP analysis (Figure 1) was performed by an internationally standardized method for the three clinical isolates showing the same pncA mutations , and the hybridized membrane was detected by the colorimetric method using the Roche digoxigenin detection kit (F. Hoffmann-La Roche Ltd., Switzerland). 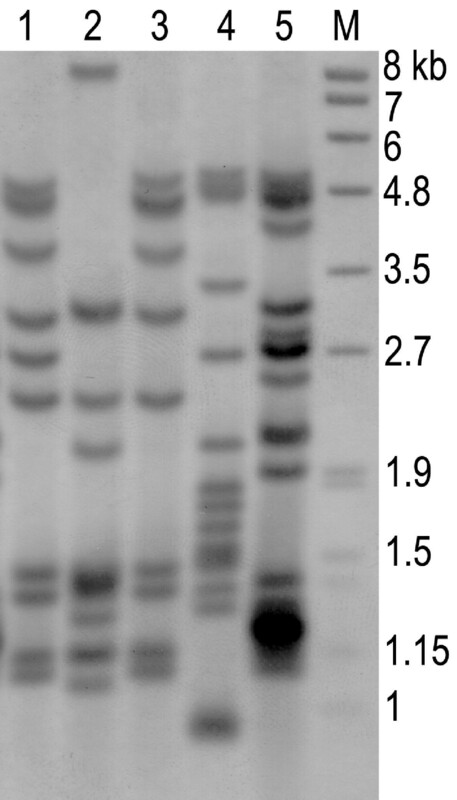 The 245-bp mycobacterial IS probe was amplified by PCR with a DIG DNA labeling kit (Roche) using INS-1 and INS-2 primers. RFLP analysis patterns of three strains containing promoter mutations. Lane M, molecular markers; lanes 1-3, tested strains containing -11 upstream adenine to guanine substitutions; lane 4, M. tuberculosis H37Rv; lane 5, clinical isolate as a control strain. All five isolates collected from our hospital were PZase-positive and susceptible to PZA with minimal inhibitory concentrations (MIC) of <100 μg/mL, which is consistent with the initial routine tests. These isolates had pncA sequences identical to the published sequences of pncA of M. tuberculosis H37Rv . Among the 23 isolates collected from the Korean Institute of Tuberculosis, one was PZase-positive and susceptible to PZA (MIC <100 μg/mL). It had no pncA mutation in the entire open reading frame, including the upstream region. All of the remaining 22 isolates were negative for PZase activity and resistant to PZA (MIC >500 μg/mL). Among them, 21 organisms (96%) had mutations in the pncA gene. Eleven organisms had twelve point mutations, including two point mutations in one organism, which resulted in one silent mutation, one nonsense mutation, and 10 missense mutations. Of those, six mutations have not previously been described. One strain with a silent mutation actually had another missense-type point mutation. Three isolates had upstream mutations at nucleotide -11, the single most common mutation, resulting in an adenine to guanine change. One had a 3-bp insertion, resulting in a slipped-strand mispairing of PncA. Four had 1- or 2-bp insertions, and two had a 2- or 234-bp deletion, all resulting in frameshift mutations in PncA (Table 1). A clustering tendency was apparent in that 40% (6/15) of the point mutations were located in the region between residues 132 and 142 of the PZase sequence. Among the three strains with the promoter region mutations, one isolate showed a clearly different RFLP pattern from the other two. a Two point mutations, including silent one, in a single strain. b Previously described mutation [4, 9, 11, 14, 16]. c Previously described mutation . d Previously described mutations . e Previously described mutation . f Previously described mutation [5, 14]. The PZase test has been used for the differentiation of M. tuberculosis from M. bovis, M. avium complex from niacin-negative M. bovis, and M. marinum from M. kansasii . The test also has been used for the detection of PZA-resistant M. tuberculosis strains . However, the test has a shortcoming in that if old colonies are used, false-negative results may be obtained. It seems that in stationary- or death-phase colonies, the enzyme activity is reduced below the limits needed to get a positive reaction. This explains why one of the 23 strains that had resulted in a negative PZase reaction turned out to be PZase positive in this study. Of the 22 PZase-negative strains, 21 (96%) showed pncA mutations in this study. In other reports [5,8,9], pncA mutations were found in 72% to 87% of PZA-resistant strains and in 97% of PZase-negative strains. Sreevatsan et al  suggested the possibility of another mechanism of PZA resistance because no mutation in pncA or its upper promoter was found in 28% of PZA-resistant M. tuberculosis strains. In contrast, Hewlett et al  demonstrated the low reproducibility of susceptibility to PZA, and Scorpio et al  proved false resistance to PZA in susceptible strains. So, if any other resistance mechanism exists, it plays only a minor role in PZA resistance, and more than 95% of PZA-resistant M. tuberculosis strains likely harbor pncA mutations in this study. Twenty-two mutations included single nucleotide substitutions, resulting in silent, missense, or nonsense mutations, and deletions and insertions of as many as 234 nucleotides. Of those, six single point mutations in seven strains have not been described in previous studies [3, 4, 5, 9, 11, 12, 13, 14, 15, 16]. These mutations are arrayed along virtually the entire length of the gene , even though a clustering tendency was apparent in that 40% (6/15) of the single point mutations were located in the region between residues 132 and 142 of the PZase. The clustering tendency in this region was described previously [5, 12]. In addition, however, we think that attention should be paid to the mutations in the promoter region, especially the -11 upstream region. Although no strains having this type of mutation were described in some studies, the results of other studies, including the present one, demonstrate that it is the most common type of pncA mutation [4, 5, 9, 11, 13, 14, 16] (Table 2). Moreover, most of the mutations were substitutions of guanine for adenine. The consensus sequence TATAAT, known as the pribnow box or -10 site, is located approximately 10 bp upstream of the transcription start site of many bacterial genes. So, it seems that mutation of the -11 upstream site blocks binding of RNA polymerase to the promoter site, resulting in inhibition of transcription in the correct place. However, further experiments such as in vitro mutagenesis should be performed to demonstrate the relation between the promoter mutation and loss of PZase activity. Theoretically, the same mutations of the pncA genes would rarely be present in unrelated isolates because mutations occur randomly along the whole pncA gene. Therefore, pncA mutations could be a useful tool for epidemiologic investigations. In fact, Cheng et al reported that 21 strains having the same mutations were found to be highly related by molecular typing, suggesting an outbreak from a single source . However, the same mutations within a region with a clustering tendency, such as the -11 upstream region and the region between residues 132 and 142, do not necessarily mean related strains. In the present study, one of the strains with the promoter mutation showed an RFLP pattern different from those of the other two, suggesting different sources of infection. In fact, the three strains were collected during the years 1985, 1990 and 1993, and the two strains of the same guanine to thymine substitution at nt 395 were collected in 1990 and 1997, suggesting that strains with the same mutations came from different sources. Thus, we think that pncA mutations should be applied carefully for epidemiologic analysis. These data provide a better understanding of the molecular basis of PZA resistance and expand the data on pncA mutations worldwide. Furthermore, it was demonstrated that adenine to guanine point mutations in the -11 upstream region are the most common type of pncA mutations. Because of the different RFLP patterns in the strains having the same mutations, the results of pncA mutations should be carefully interpreted for epidemiologic purposes.